Jofran's Plantation Collection glass top tables are designed to blend into any décor, in any home. A rich finish paired with beautifully beveled tempered glass are the staples of the tables, but the magnet-covered hardware is the piece de resistance for these contemporary-perfect pieces. 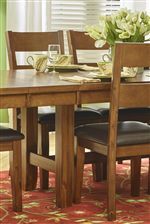 The Plantation collection is a great option if you are looking for Casual furniture in the area.